It may surprise you to learn that hundreds of women undergo surgery every year to reshape their labia minora, the inner labia. These women are both young and old, have many different ethnic backgrounds, and they choose to have labioplasty for a variety of reasons. Some of the reasons have to do with physical discomfort and others relate to emotional discomfort, including self-consciousness about the appearance of their labia. The goal of labia minora surgery is to reshape the inner labia for increased comfort, less protrusiveness, or a more aesthetically pleasing appearance. It may also repair stretching caused by childbirth. If you are considering labiaplasty because you are unable to reach climax during sexual activity, you may be interested in clitoral hood refinement. The process of reshaping your labia minora may be performed in several ways. In the simplest version, Dr. Rai excises the leading edge of the labia minora, removing excess skin and tissue, and suturing the incisions. In a newer, alternative procedure, Dr. Rai makes a V-shaped incision to remove the center section of each side of the labia. The two sides of the V are then sutured together, creating a lateral line rather than a long incision along the leading edge. Dr. Rai also performs a refinement of the V-section procedure in which each arm of the V has a Z shape. These arms are brought together to reduce the visibility of the scar and the likelihood that it will contract. You would choose a labiaplasty variation depending on your anatomy and the results you desire. During your consultation Dr. Rai will listen to your concerns and goals and will recommend a procedure for you. Recovery time averages between four and six weeks, but because the tissue may still be weak, you should wait for Dr. Rai’s clearance before resuming normal activity. Following Dr. Rai’s directions during recovery is crucial to reducing the risk of complications and ensuring the quality of your results. You should keep your follow-up appointments to avoid complications. To learn more about labiaplasty or labia minor reduction, please visit Why have labiaplasty? 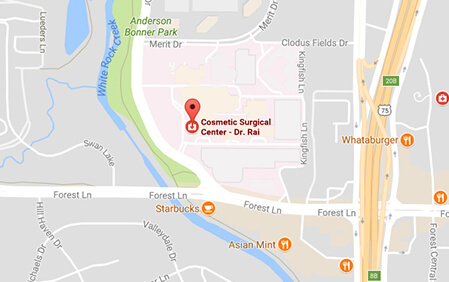 or contact Dr. Rai at The Cosmetic Surgical Center. We serve Forth Worth and Dallas in Texas and look forward to meeting with you.